This is a review of the product HairBurst. The manufacturer of the product claims that these vitamins can help you grow longer and stronger hair. Read on, to know more about the ingredients of this product as well as our opinion of whether it is the right product to take for the health of your hair. It is recommended that adults two capsules of this product daily, preferably with a meal. There are no known side effects of this product as it is made up of completely natural ingredients. However, pregnant and nursing women along with anyone that is suffering from any disease or taking some other medications should consult with their doctor before using it. In case of an allergic reaction to any of the ingredients in the product you need to discontinue use and get immediate medical attention. The price of one bottle of this product containing sixty capsules (enough to last a full month) is listed as $38.26 on the website of the company. The three-month supply of this product is available for $96.44 at a discount of $12.24 and the six month supply is available at a price of $183.70. The manufacturer also offers a twenty percent discount if you choose recurring billing and one bottle can be purchased at a price of $30.60. The manufacturer of this product does offer a money back guarantee. However, the terms of the money back guarantee have not been mentioned clearly by the manufacturer as it has not been specified how many days you have to return the product and what condition it needs to be in. There only a few reviews of this product on the website of the company which are mostly positive. 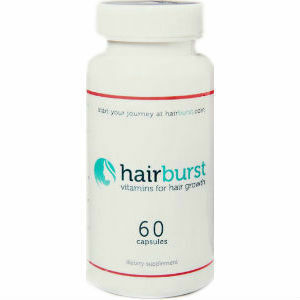 HairBurst vitamins for hair growth can provide nourishment to your hair from within and also improve the overall health of your hair making them longer and stronger. It can also increase the strength of your hair and improve their elasticity thus preventing their breakage. The ingredients of the products are completely natural water-soluble vitamins with nothing artificial and it is also fit for consumption of vegans and vegetarians. It can also be used by both male and female users over the age of 12 and you can expect an average hair growth of one inch per month. However, it cannot cure baldness and is meant only to support the hair already on your scalp. In addition to this, the manufacturer of the product has not signified the terms of the money back guarantee like the time the users have to return the product and the condition it needs to be in. The price of one bottle of this product at $38.26 is also very expensive and without any clear money back guarantee it makes it difficult for users to spend such an amount on this product. So, the bottom line is that this is not the ideal product for you. John Brownstone	reviewed HairBurst	on November 20th	 and gave it a rating of 3.